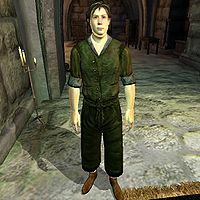 Colin Stedrine is a Breton commoner who works as a servant at Anvil Castle. Every evening at 8pm, Countess Millona Umbranox hosts a dinner party involving most of the inhabitants of the castle, as well as a few prominent Anvil citizens. Colin is, in collaboration with the other servant, Beatrice Gene, in charge of making sure everything is prepared and ready for the event. He sleeps in the southern part of the dining hall every night between midnight and 6am. After waking up, he goes down to the small dining area reserved for servants, and eats breakfast with his colleague Beatrice Gene. At 8am, they both start preparing the area for the upcoming dinner and keep working until 5pm. At that time, they find a seat and enjoy a two-hour dinner. After another hour of preparation, the guests finally arrive, and Colin finds his usual spot near the big dining table, making sure all the guests are satisfied. After the last guest leaves, Colin heads back to his bed and falls asleep. He wears a pair of green felt linens with a green wool shirt and huntsman moccasins. He carries a key to the castle and a small amount of gold. This page was last modified on 20 October 2015, at 05:21.